Yesterday a 20-something co-worker said, “You have such stylish hair!” and my inner 16-year-old’s heart leapt in exaltation. In the past few years, I’ve started playing with my hair, using it as a canvas of tonsorial delights. Yesterday, I’d pinned in red and orange streamers, fastened with a gold butterfly. 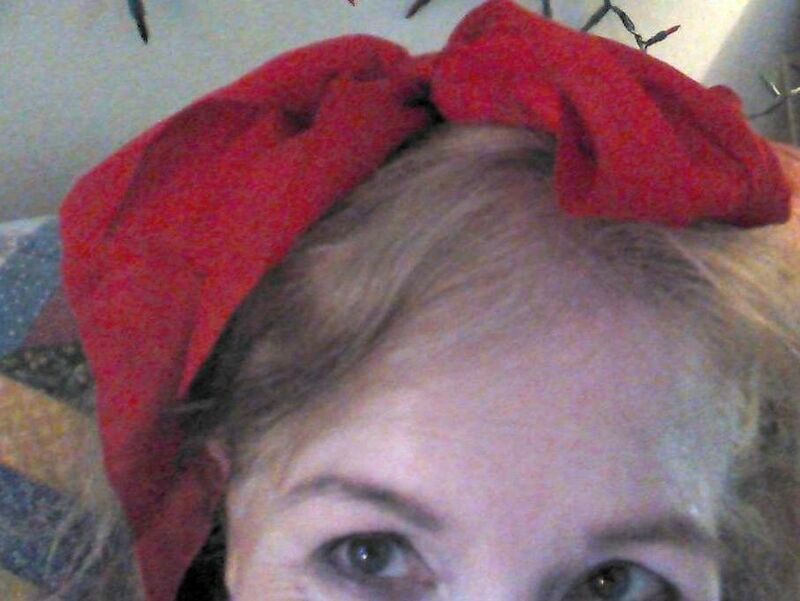 Sometimes I tie a big red bow in my hair. Or decorate it with multicolored bejeweled clips. I also have hair chalks so I can paint it to match everything I wear. I’ve developed somewhat of a rep at work for doing crazy things to my hair, and what I love most about it is the fun I have doing it. Because it wasn’t always this way. When I was coming of age in the 60s, long, straight hair was all the rage and my naturally curly locks were considered anything but stylish. I HATED my hair. Trying to tame it, I used giant frozen orange juice cans as rollers (try sleeping with those jabbing your scalp). I ironed it until it steamed. And while those desperate attempts may have worked temporarily, the truth would always come out. I remember one day in 9th grade getting stuck in a rainstorm at Juan Crespi Jr. High while waiting for the school bus. We all got into the bus, drenched, and on the trip home, as I watched classmate Linda Hart’s long, straight dark tresses dry into shiny perfection, I felt my own drying hair frizz up and stick out until all I needed to be Bozo the Clown were the big floppy shoes. I was mortified as only an adolescent girl can be. That’s why, these days, every hair decoration feels like an honor well-deserved. And when I say now, honestly, that I love my hair, I mean “love” as a way of honoring and caring for it — making it as beautiful as possible. We can “love our bodies” in a way that means we think we have the most perfect hips, the best waistline, the greatest legs — or we can “love our bodies” in a way that means we treat it tenderly, giving it the most healthful food, making sure it gets exercise, and dressing it in a way that makes us feel authentic. So when I say I love my hair, I don’t mean that I think it’s the most beautiful hair ever. I mean that I treat it as if it were. Adornments, decorations, color, bling. It’s been a long journey from hair-hatred to locks-love. My teen self would have been horrified at the thought of drawing attention to these unruly curls. My grown-up self smiles triumphantly with every purple streak I paint.